California-based photographer Rosemary Sheel travelled to Uzbekistan and Kyrgyzstan in October 2012. Rosemary and her companion, both passionate photographers, with special interests in markets, animals, tribal people and remote villages, travelled independently. Uzbek Journeys arranged cars, drivers and local guides for their trip. What a pleasure it is to dip into Rosemary's website. I like Rosemary's eye and her curiosity: how she notices the small details and describes the setting, people, light and context for her posts. Indeed she weaves a very personal story about her subjects. She is also a generous photographer, sharing the techniques used to create a special effect or discussing why a certain angle or light was selected. By subscribing to Rosemary's blog I receive a daily treat. As the Uzbek and Kyrgyz trip was her most recent, the image is generally from Central Asia. And if it is not Central Asian, it is still a great image and interesting view about a remote place. I sip a green tea and dream a little. "Suddenly, the woman in the photo tapped me on the shoulder and gave me to know that she wanted me to take her photo. By the time I’d lifted my camera to my eye, she was posed as you see: her hand caressing the bald pate of her husband. Her expression is contentment itself. She makes me think of a cat curled on a cushion. His expression is contentment as well, but he’s a bit shy because he won’t look into the camera. I like his diffidence. I think he’s a manly man. He wants his wife to be happy and he accepts her flamboyant way with a barely perceptible smile. 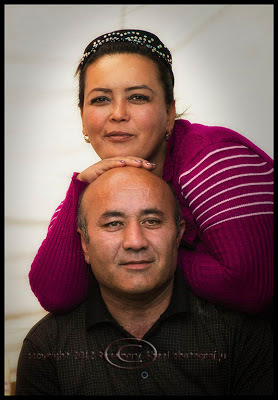 I show you this photo because I want you to ‘know’ this woman and her personality: to have an idea of what an Uzbek couple might look like and act like. You can see Asia in the man’s features, but she looks very European. Uzbek faces were not uniform. 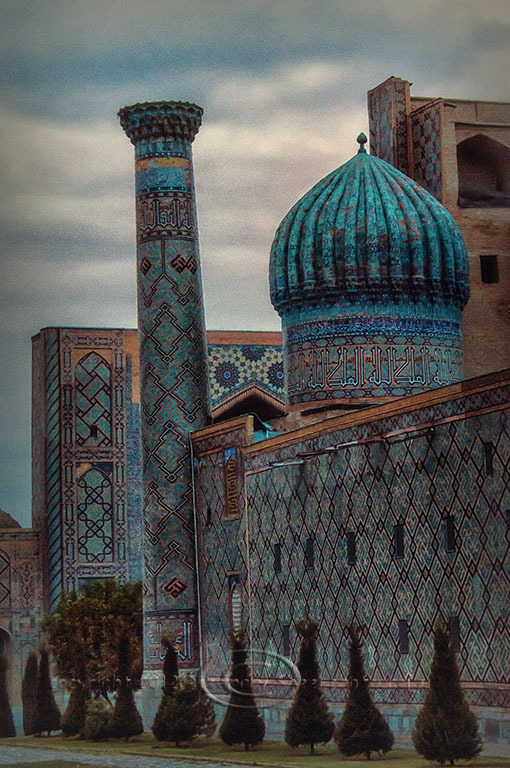 Uzbekistan is like America in that way; you can’t pick a ‘look’. Tall, muscular, fair men told me they were 100% Uzbek. I’d have said that they were Russian or Eastern European. I might add that most, the youngish ones, were handsome. Very. The women could be tall and fair or dark and slender". "You might call him an ‘eagle whisperer’. 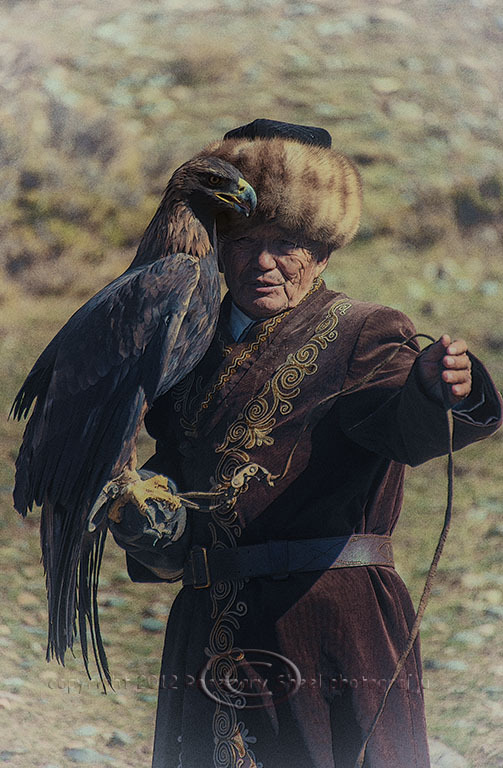 He is looked up to by younger Kyrgyz men who want to learn the skill of hunting with an eagle. We could see that he and his bird were a team. He talked to his bird to calm her, to encourage her, to praise her. That was the best part for me, to see the relationship between the two of them". Regrettably I did not meet Rosemary last autumn in Central Asia. But I know by reading her blog that we would have gotten on famously. Have a wander through her Uzbekistan images and likewise her Kyrgyz pieces. You may even think about subscribing to her daily image. It is a lovely way to remember your trip there or to dream about future travels. Hopefully Rosemary will add some of her Central Asian experiences to her Travel Stories section.